Deconstructed Quilt Blocks ... ‘Cause Size Does Matter! The act of reducing (something) to it's constituent parts in order to reinterpret it. Quilt block size limitation has been a challenge for quilters choosing to use the precision of their embroidery machines to make quilt blocks. Compatibility with common embroidery hoop sizes required that our blocks finish at 4, 5 or 8 inches. De-Constructing quilt blocks and making each component block section as a single hooping allows us to make component sections of the block as large as our largest hoops. Comparison: Our original Storm at Sea was developed for the largest common sized hoop and finished as an 8" block. 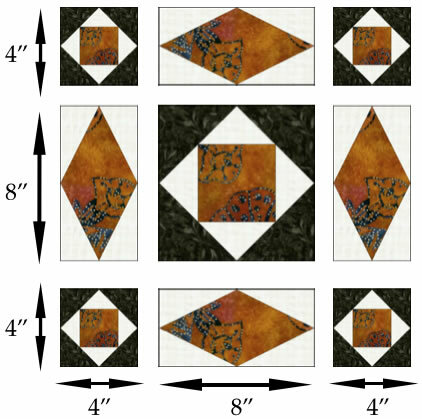 Our new De-Constructed quilt block rule set allows us to complete the Large Square in a Square (center) as an 8" section. De-Constructing the quilt block and increasing the largest section of the block to 8" increases the assembled size of the block to 16". The smaller Squares in a Square and the Diamonds in a Rectangle are 1/2 as wide as the large Square in a Square used as the center. 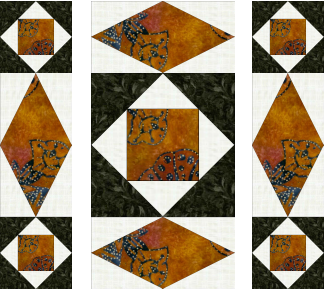 Note: Queen of Stitching designs include multiple sizes as we realize sixteen inch quilt blocks are not always desired. 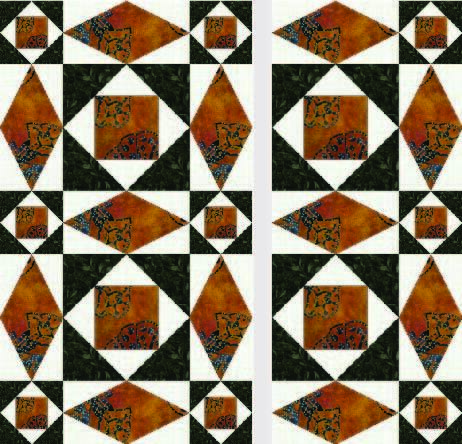 Columns/Rows are made by joining multiple quilt block sections using our “Joining Quilt Blocks With Continuous Batting and Backing Strips method. Columns or rows are joined together using our "Join As You Go With Continuous Batting and Batting Process" to complete the design. What Made Us Think About De-Constructing Quilt Blocks? The answer is simple - We changed our perspective - or how we look at and interpret quilt blocks. Experienced quilters know that for a very long time - square quilt blocks have been categorized using a grid system. Examples are Four Patch, Nine Patch, Unequal Nine Patch with Large Center Squares, etc. As developers we maintained block integrity as previously defined. When making a Four Patch block design (two horizontal patches and two vertical patches) for our 200mm hoops - each of the patches had a size limitation of 400mm by 400mm giving us a finished block size of just under 8 inches. We realized if we De-Constructed quilt blocks - based on existing grid theory, we could make each grid section of the quilt block as large as our largest hoop. Interpreting quilt blocks with our new De-Constructed rule set allows us to double, triple or quadruple the size of our quilt blocks without using larger hoops. How Are These Larger Deconstructed Block Sections Assembled into Quilt Blocks? Deconstructed quilt block sections (left side, right side, center, etc.) are assembled either in horizontal rows or vertical columns and work brilliantly with Queen of Stitching’s method for joining quilt blocks in the hoop with continuous batting and backing strips. 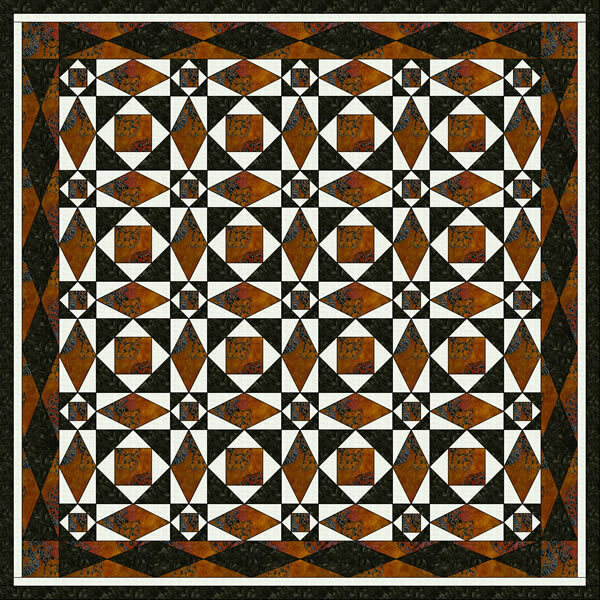 Once the rows or columns are joined together - all of the quilt blocks become fully visible or recognizable. 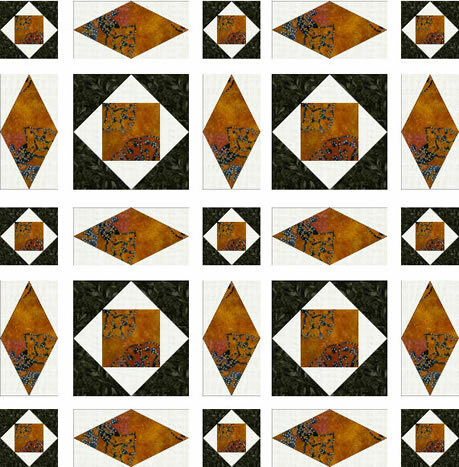 Can All Quilt Blocks Be Enlarged Using the Deconstructed Rule Set? At this point we believe not. However, most blocks that are considered multi-patch blocks for the grid system should be enlargeable using our deconstructed rule set. A brief introduction to Deconstructed Quilt Blocks is presented at the beginning in our latest “Join As You Go" video.